People felt Glasgow had paid too much for the work by forking out £8,200. Many also considered it old-fashioned. However, the painting has become one of the city’s greatest assets and is now thought to be worth millions of pounds. It won a poll to decide Scotland’s favourite painting in 2006, with 29% of the vote. The fact that Glasgow City Council owns the copyright for the image means it has paid for itself many times over in sales of postcards and reproductions. The title of the painting is said to have been inspired by a drawing by a Spanish Carmelite friar who was canonised as Saint John of The Cross in the 16th Century. The painting was created to capture the moment when the saint had a vision in which he saw the crucifixion from above. Dali set the scene above the harbour of his home village of Port Lligat in Spain. It was attacked with a brick and badly slashed by a religious fanatic in 1961. Then, 20 years later, a vandal shot at it with an air rifle. 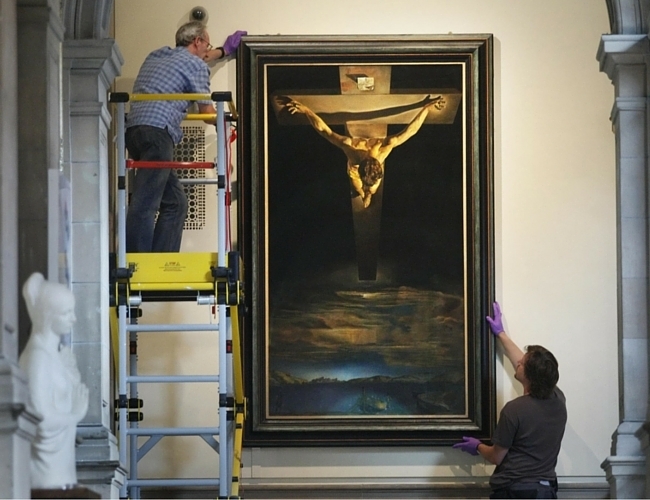 It was displayed at St Mungo Museum of Religious Art between 1993 and 2006. However, it came back to Kelvingrove in 2006 to coincide with the gallery’s reopening following a £30m revamp.